We found out today that our I-800 was approved. We received our I-797! Soon everything will be authenticated and our dossier will be sent to China! As papers soon make their way across the ocean, I know we move closer to our daughter. Hopefully in 6-9 months, we will see a photo of our daughter for the first time. Because of that knowledge, I feel like I am “carrying” her differently now. With my new “hold,” I have allowed myself more freedom to move into a deeper level of anticipation. I anticipate meeting her for the first time.I remember during pregnancy anticipating what it would be like to see and touch my children for the first time. With this precious daughter, it is no different. I have been carrying the idea of adoption for over six years. I long to touch my daughter for the first time, to feel her skin against my own, and embrace her with my arms. I thrill at the thought of watching her personality bloom.One of my favorite parts of being a mom is watching my children blossom and become who she or he was created to be. I am excited to see how this little one is wired, to see how she processes life, to watch her learn, and to recognize the gifts our Creator has given to her. I long to hear her laugh.There is no sound I like more than a child’s laughter. Joeli and Eden Samuel have these awesome belly laughs. When I miscarried Joy, the first thought that circled through my mind pertained to laughter: “I will never on earth know the sound of her laugh.” I become giddy with excitement to think about when I will first hear my new little one laugh. I can’t wait to hear those great belly laughs that in time will come as she feels more comfortable with us that will shake heaven with delight. CAN. NOT. WAIT. I look forward to how God will continue to teach me about his adoption of me through the adoption of my daughter. This adoption process has taken me deeper into the divine-human adoption strategy. I have much to learn and receive about God’s gracious adoption of me, and I am excited for the opportunity to hopefully reflect some of what God has done for me to my little one. 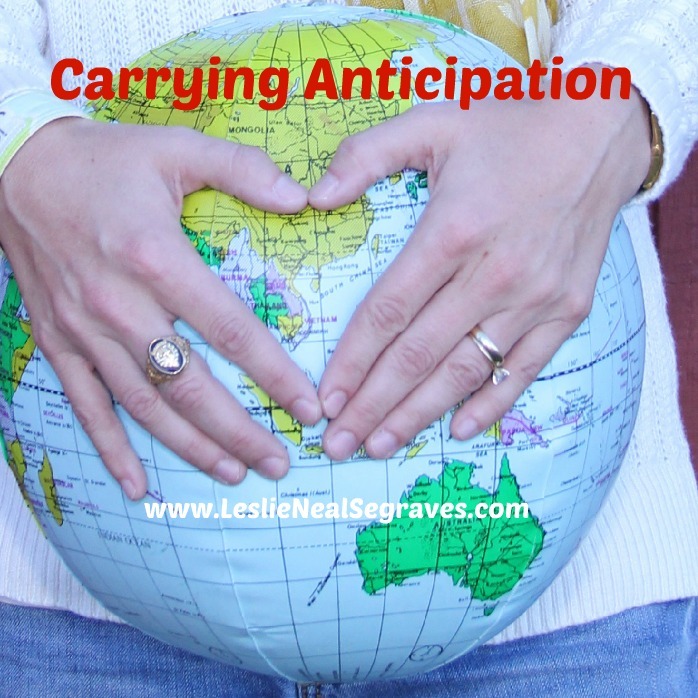 I am carrying anticipation each day, knowing I am moving closer to my daughter.